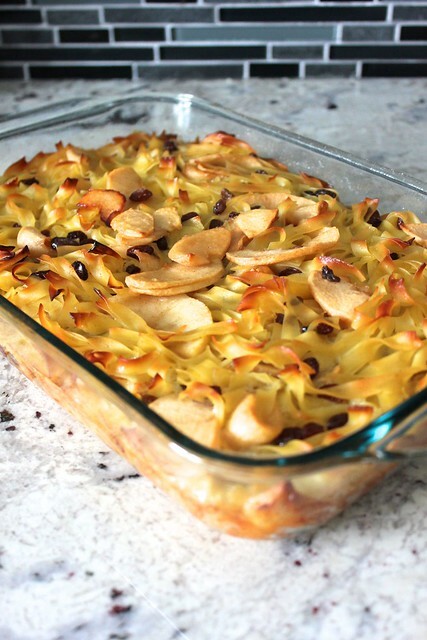 Sweet noodle kugel is a traditional comfort food that I always look forward to, because the crispy, crunchy noodles on top are so delicious and fun to pick off. But noodle kugel deserves to be eaten in its entirety, and that’s where I decided to break with tradition (and my grandma’s recipe). 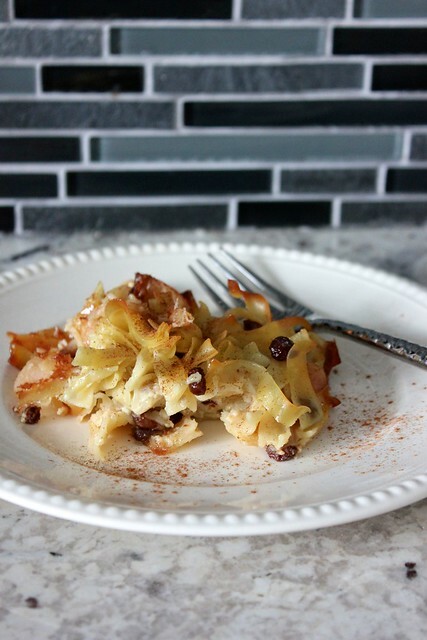 Sweet kugel is typically made with canned or dried fruit- not the most popular ingredients. This version uses fresh, sautéed apples and (surprise!) raisins that are plumped and pickled in an apple cider vinegar solution. The raisins are flavor bombs that provide a slightly tangy balance that will keep you coming back for more. 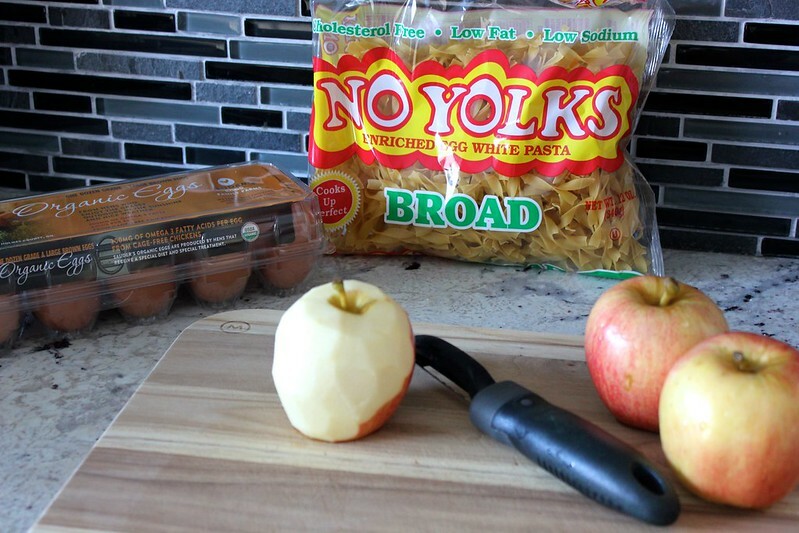 One thing that hasn’t changed, however, is the No Yolks® Noodles. To make this kugel, bring a large pot of salted water to a boil, and cook 12 ounces of No Yolks ® Broad Noodles for 8 minutes. While the water is heating, peel 3 apples, halve them, remove their cores, and cut them crosswise into 1/8 inch thick slices. 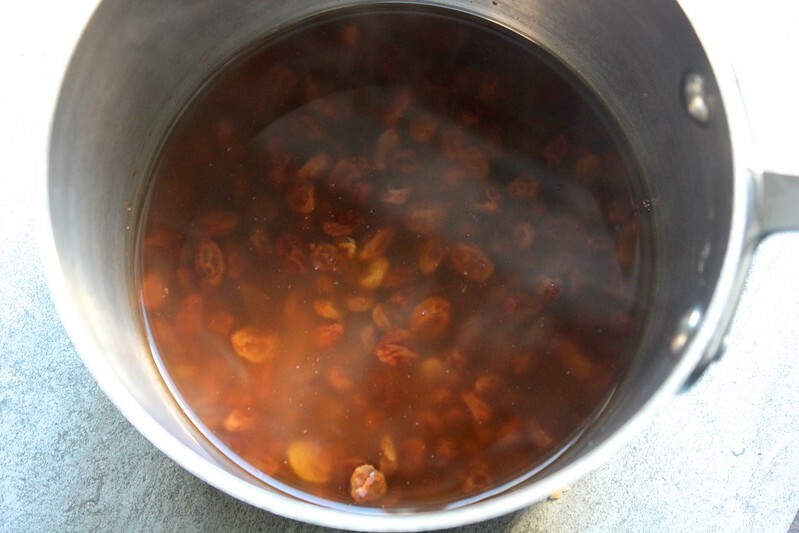 At the same time, add 1/2 cup raisins, 1/2 cup water, 1/2 cup apple cider vinegar, and a pinch of salt to a small pot. Put a lid on the pot, and bring the liquid to a boil. Then, turn off the heat, and allow the raisins to sit until you are ready to use them. During this time, they will plump and pickle. When the 8 minutes are up for cooking the noodles, pour them through a strainer and run cold water over them to stop them from cooking further. 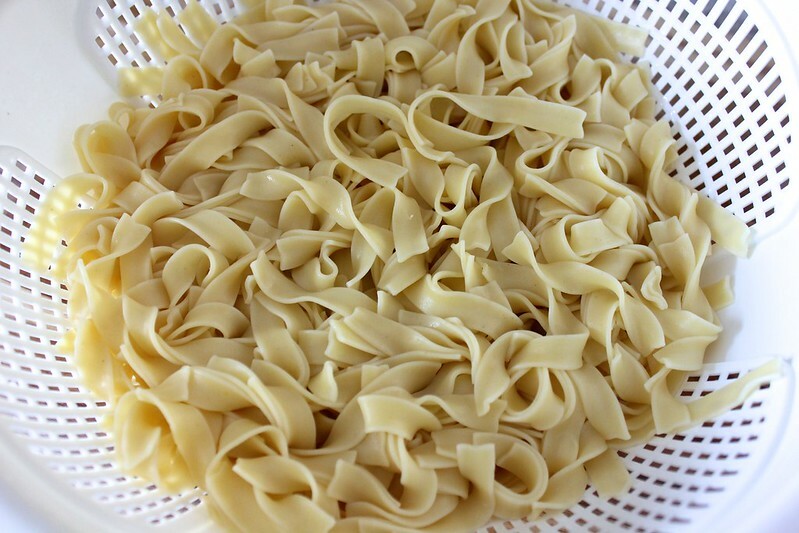 Give a noodle a taste- it should be smooth, firm, and delicious! Try to stop yourself from eating them all. 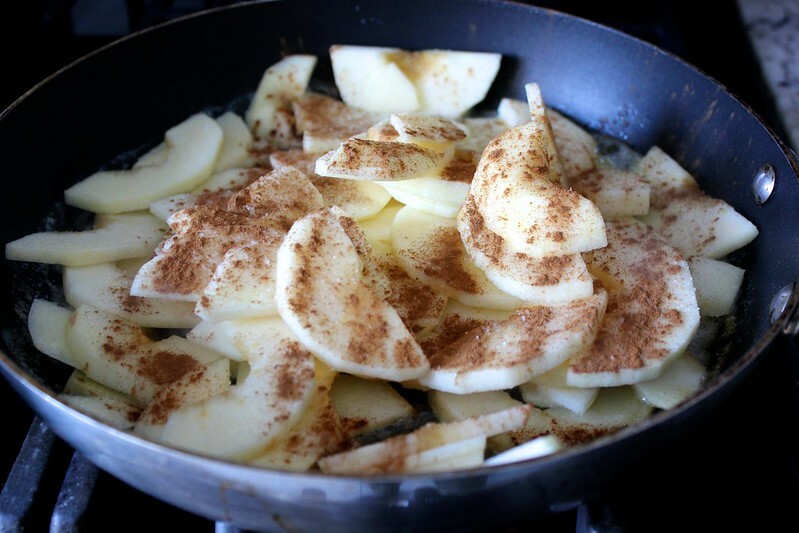 Melt 4 tablespoons of butter in a saute pan, and add in your sliced apples, 1 teaspoon of cinnamon, and a sprinkling of salt. 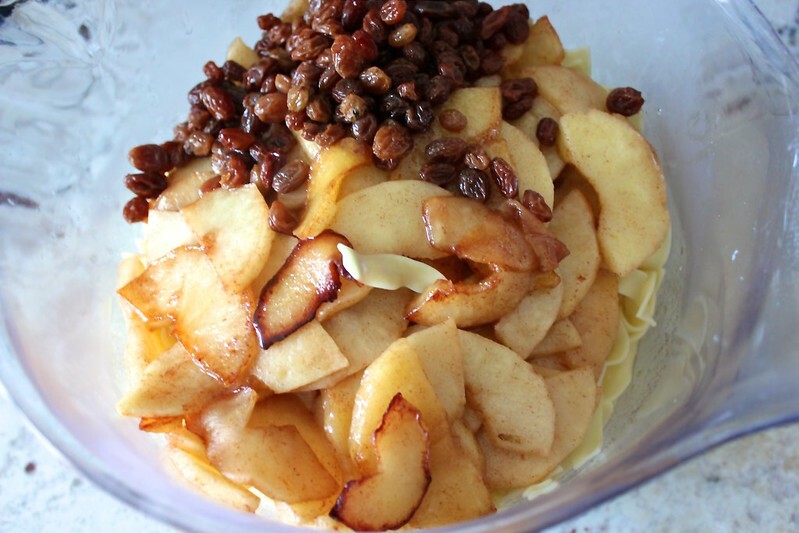 Cook the apples, tossing them occasionally, until they soften into a noodle-like state and are lightly caramelized. I know the butter takes this kugel into dairy territory for anyone who keeps kosher (unlike a traditional sweet kugel), but it’s just too delicious to omit. While the apples cook, preheat your oven to 350° F. In a very large bowl, whisk together 4 eggs, 1/4 cup of vegetable oil, 1/2 cup of sugar, 1 teaspoon of vanilla extract, and a dash of salt. Add the drained noodles and sauteed apples to the bowl. Drain the pickled raisins (don’t rinse them), and add them to the bowl too. 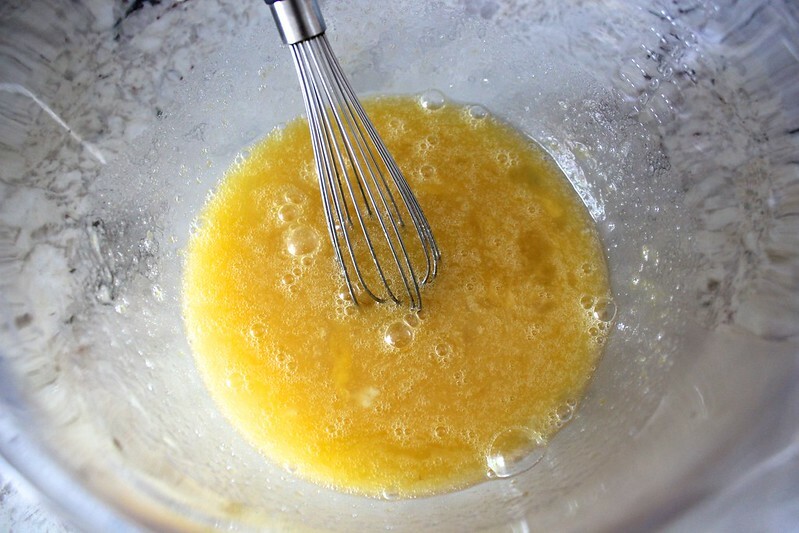 Stir everything together so that it is evenly coated and combined. Lightly coat a 9×13 inch baking dish with cooking spray, and pour the kugel mixture in evenly. Sprinkle the top of the kugel with 1 tablespoon of sugar for an added crunchy topping. 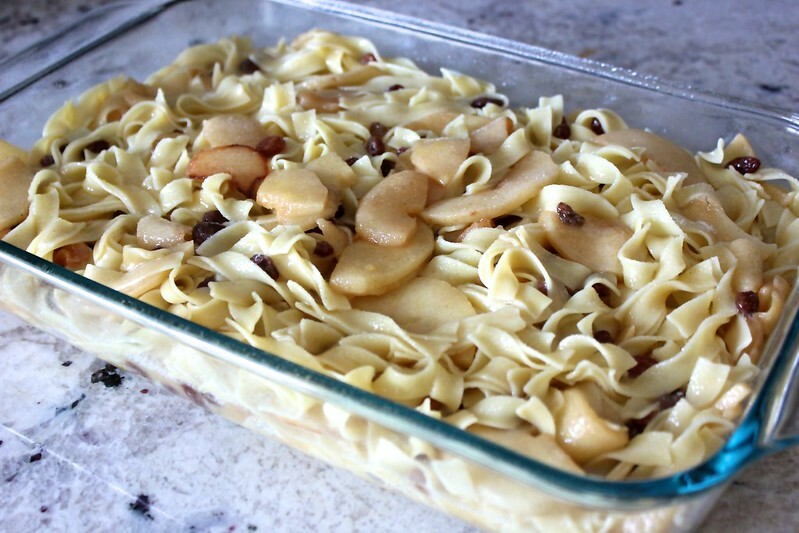 Bake the kugel for 1 hour until it is golden brown on top and the noodles are crispy. Allow the kugel to cool for a few minutes before serving. Sprinkle some extra cinnamon on top of your slices for the prettiest presentation. Now tell me, what is your favorite traditional recipe that would be even better with a modern update? I would love to hear your ideas, and even better, each comment will automatically be entered to win a $100 Visa Gift card. And for more noodle ideas, try one of these family-favorite, comforting No Yolks® Noodle recipes. Tell us what your favorite comfort food is for a chance to win a $100 Visa gift card! This sweepstakes runs from 2/22/16 – 3/27/16. My comfort food is mac n cheese! My favorite is Greek stew – it brings back so many happy memories. My favorite comfort food is pizza. I’d like to see an updated version of meat loaf. I haven’t found a recipe that I really like, although when someone else makes it I really enjoy it. My favorite comfort food recipe at meal time is King Ranch Chicken Mac and Cheese. My homemade chicken pot pie is my favorite comfort food recipe. Homemade chicken dumplings are my favorite comfort food — especially perfect in the fall and winter. my favorite traditional noodle recipe that could use an update or spice would be just spaghetti and meatballs! My favorite comfort food is French Toast. I love tuna casserole as my comfort food! I love Thai peanut noodle salad with hot peanut dressing.